Let me start off my saying that this place serves an amazing sandwich. Blew my mind with how lean the steak cuts were yet also remained very tender. Let me start off my saying that this place serves an amazing sandwich. Blew my mind with how lean the steak cuts were yet also remained very tender. The fries also had a very good seasoning. It was a little annoying that I had to pay an extra buck for the green peppers and mushrooms but I feel like it drastically improved the quality of the sandwich. I really wish they had a combo option. I seen this trucked packed today at metro center, so I stopped by I had a steak and cheese with seasoned fries! It was great the bread tasted really good and was toasted and the steak portion was very generous! This is definitely one of my favorite trucks!!! best cheesesteak in town. it was delicious, fresh, good mix of cheese/meat/veggies. but, the bottom half of the roll was pure mush (they didn't drain it or the ltm caused problems). So, I had to throw it away; but the top half of the roll was fine, so I give this 4 out of 5. That was the best damn steak and cheese I've had in years!!!! the best Food truck that I have been to, professional and quick the and the sandwich I have was like being in South Philly. I've had the original and the special, both times with fries. really well done and you get alot for the money. remember that the fries are seasoned (lightly). wish they had onion rings. Without a doubt the best cheesesteaks and gyros among the available food truck options at Farragut. If you are not sure what to order, their guys are extremely helpful in recommending a tailored cheesesteak or gyro that fits your taste. Philly Mike’s Steaks was spotted serving the District in Spring 2013. Though they have a Twitter account, they have not been tweeting locations, so they are impossible to find. 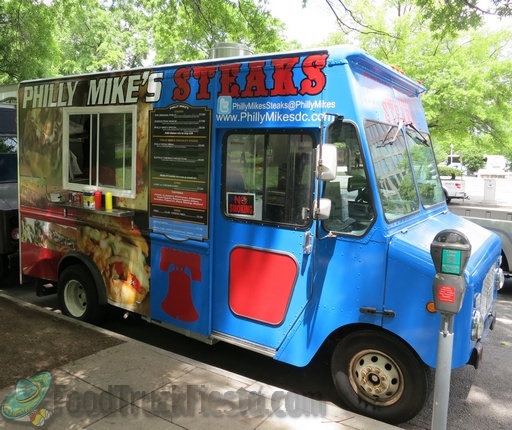 Philly Mike’s morphed into George’s Buffalo Wings truck in August 2013.